How To Have An Amazing Life? You are here: Home / Personal Development / Self Improvement / How To Have An Amazing Life? Everyone starts out with the dream of living the type of life of which books are written. Unfortunately, most of us end up living exactly the type of life we wanted to avoid. Luckily, it’s never too late to turn your life around and create an exciting adventure for yourself! View challenges as opportunities. You’re more creative and clever when your attention is focused. Challenges are great opportunities to take your life to the next level. The more challenges you overcome, the more amazing your life will be. Be nice. Each person you meet can do something for you. It might be teaching you something important, introducing you to the right person, or giving you your dream job. Who knows? Treat everyone with kindness and respect and your life will be enriched. Follow the Pareto Principle. Everyone thinks they don’t have enough time in the day. It’s simply not true. Most people simply don’t spend their time on the right things. It’s a safe bet that 80% of your time is largely wasted. Focus your energy on the 20% that matters the most. Have goals. Your focus, time, and energy need a direction. Goals provide that direction. You might be smart, capable, and charming, but it won’t matter if you don’t have any goals. Set a few goals and create your destination. Focus on the present. Worry and regret live in the future and the past. Keep your mind focused on the present and you can avoid both. Cultivate mindfulness with activities like meditation and yoga. Avoid worrying about the opinions of others. While it might be a hard pill to swallow, the fact is that most people don’t spend their time thinking about you. They’re too busy worrying about themselves. You’re freer than you think! Be biased toward action. You know at least a couple of people that are smart, pleasant, and capable that struggle to manage their lives. If you’re predisposed toward thinking rather than taking action, life will roll right over you. Spend a little time making a good decision, then get busy! Smile. You’re more likeable and happier when you smile. It’s free, too. Try smiling everywhere you go for a week and notice the difference. Choose experiences over possessions. The western world is far too focused on houses, cars, boats, and other symbols of wealth. Your life will be richer and more amazing if you focus on having incredible experiences. It’s the perfect time to make a few changes. Maybe your life has been pretty uneventful and hum-drum to this point. That doesn’t matter. All that matters is what you choose to do going forward. 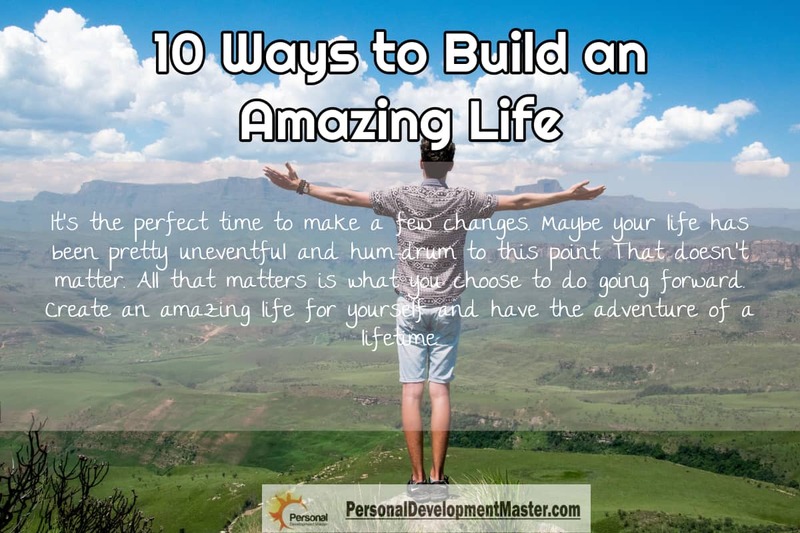 Create an amazing life for yourself and have the adventure of a lifetime.